Yesterday, the Pew Research Center (a non-profit research institute) in the U.S. released an interested poll with the Washington Post on the public’s reaction to the debt ceiling debate. 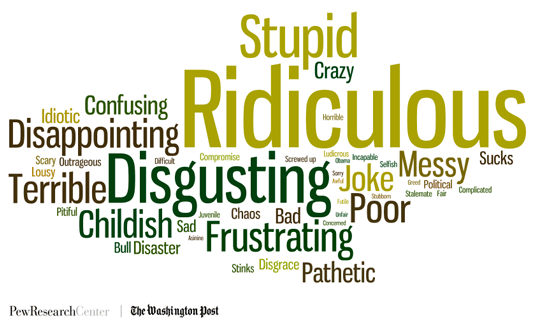 The asked a simple yet effective question: If you had to use one single word to describe your impression of the budget negotiations in Washington, what would that one word be? More creatively, they used a word cloud to display the answers (something Abacus became known for earlier this year). Overwhelmingly, and perhaps not that surprisingly, Americans reacted negatively to what was happening in Washington. Using words like “disgusting”, “pathetic”, and “frustrating” to describe what was happening in Washington D.C. demonstrates the frustration that permeates the entire country – whether a Democrat, Republican, or Independent. Word clouds and simple open-ended survey questions can be effective for identifying gut reactions and top of mind attitudes towards an issue. They are simplistic but can deliver a clear message to an audience about how the public feels about something. Back in January, we used them on Canadians’ reaction to questions about Canada’s main political parties. At the time we got some flack for their simplicity but in hindsight, those word clouds were quite predictive in explaining the outcome of the Canadian Federal Election in May. Let’s stroll down memory lane for a moment. Let’s start with the Liberal Party. 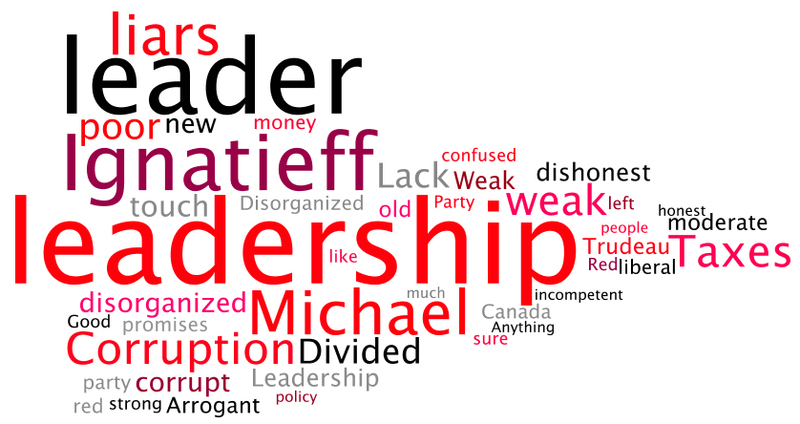 Below is the word cloud produced and notice the larger words: “Ignatieff”, “leader”, “leadership”, “corruption”, “liars” – note leaders and leadership were often attached to weak, dishonest, or disorganized. This was the Liberal Party’s brand six months prior to the election. Let’s consider the NDP’s word cloud. Once again, the word cloud is quite telling. Jack Layton is by far the most prominent words used by Canadians. All the commentary about the importance of Mr. Layton to the NDP’s brand is supported by this word cloud and explained that if Layton’s personal numbers improved, so too would the NDP’s. Finally, the Conservative Party and Stephen Harper were well defined prior to this exercise. By and large people had a fairly clear opinion of both – you either liked the Prime Minister and his team or you didn’t. The Conservative Party word cloud, apart from demonstrating the importance of Stephen Harper to the Conservative Party brand also demonstrates some of its policy strengths: the economy, honesty, and taxes. I’m still a big fan of word clouds, and this stroll down memory lane reminded me that we need to do more of them because despite some of the criticism we received over them, they have proven to be quite good at reporting qualitative data from a quantitative survey.